Theoretical models can only provide us with so much information when it comes to developing or testing a product destined for space. To avoid unanticipated issues and validate computer-driven modeling, testing in a space simulation chamber is an important part of the quality-assurance process. 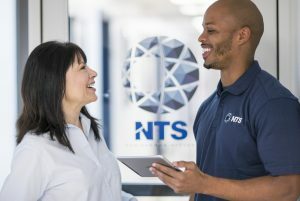 NTS is one of only a few facilities in the world capable of performing simulation testing that mimics the extreme conditions found in the upper atmosphere and outer space. By precisely controlling temperature, altitude and humidity, we give you a clearer picture of how your product will respond, allowing you to make engineering changes that reduce your liability and simplify your path to regulatory compliance. What Is Space Simulation Testing? Space simulation testing involves the use of a thermal vacuum chamber to replicate the conditions experienced in space and the outer hemisphere. Spacecraft and their components must withstand extreme temperatures and pressure to travel outside the Earth’s atmosphere. Thermal vacuum testing has a history as long as the U.S. space program. Facilities such as NTS utilize space simulation testing to mitigate risk in crewed and crewless spaceflight. Military and aerospace testing specifications ensure product compliance and functionality in all industries. Our accurate simulations of space conditions allow for a high degree of reliability and confidence in our results. The U.S. government and military partner with us for turnkey solutions involving testing to rigorous specifications. We also work with naval and defense contractors looking to meet high product standards. NTS has more than 50 years of experience testing critical systems, subassemblies and components in cutting-edge space simulation chambers. We utilize the TV-25 test system in thermal vacuum testing. This facility includes two control rooms and two adjoining cleanrooms for optimal control and safe operation. Our Class 10000 cleanroom includes a bake-out chamber that removes outgassing components and moisture before testing. As one of our largest testing areas, the TV-25 has the capacity to test a wide range of equipment and systems. NTS leads the industry in environmental testing associated with space vehicles, hardware and satellite technology. Our team can design custom chambers and fixtures to simulate a full range of space-related conditions. We use these customized apparatuses to test mechanical and electronic devices that include composite antennas, batteries and solar panels. Environmental testing allows our clients to collect performance data early in their products’ lifecycles. By detecting potential faults during the initial phases of development, our clients prepare their products for real-world use. Our decades of experience testing for space conditions allow us to anticipate performance in a variety of environments. With one of the highest degrees of accuracy in the industry, we can set you apart from your competition and maximize product safety. 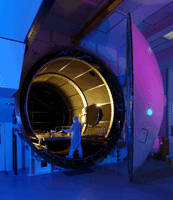 Our space simulation chambers replicate the conditions demanded by a wide range of testing programs. They combine the required humidity, temperature and altitude for accurate evaluation. NTS testing chambers for copper chloride, sulfur dioxide (SO2) and salt fog can accommodate up to a 6′ by 10′ by 8′ area. The thermal vacuum chambers at NTS have combined ambient pressures of 1×10-8 TORR and temperature extremes ranging from -320°F to 1000°F. One of our explosive atmosphere chambers can simulate temperatures to -320°F and 100,000′. Testing in critical industries such as aerospace and military makes up the heart of our company. Our testing services allowed us to grow from a single facility to one of North America’s largest networks of commercial test laboratories. The NTS engineering and evaluation team can perform additional types of testing for your product or project on request. Due to our robust, multidisciplinary experience, we can tailor our services to your specifications. In addition to testing, we can provide product lifecycle support from beginning to end. We have the capability to inspect your materials and products through every stage of development. Our source inspections, supplier development and product and process auditing ensure you have a compliant and functional creation. The space simulation facilities at NTS are ISO/IEC 17025 accredited by the American Association for Laboratory Accreditation to provide environmental, dynamic and thermal testing. Whether you are a government contractor or are working for a private space agency, we can ensure all required testing is performed to the appropriate standards. For international customers, we can aid with pre-compliance management that helps you bring your products to foreign markets with minimal investment in additional testing. 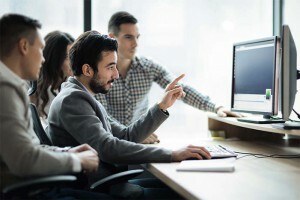 Whatever you require to do your due diligence and QA, our simulated test environments give you complete control over a wide range of variables. Our engineering experts will work with your team to develop the best testing sequence. Using sophisticated data-capturing tools, we can produce quantifiable results that either demonstrate compliance or provide you with a road map to refining your product. NTS operates simulation testing chambers in several labs across the country. Aerospace industry customers have convenient options on both coasts, where we can provide simulated space testing and other services. To discuss your project with one of our engineers or to request a free quote for a simulation test, contact an NTS lab near you.